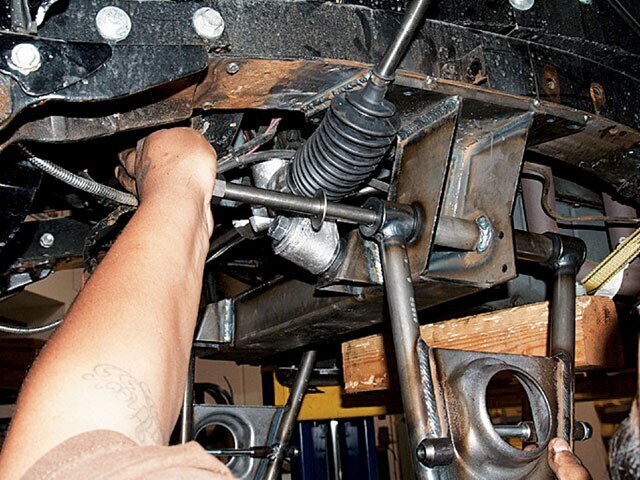 Master Image Customs Shows Us How To Modernize The Suspension Of A 70-Year-Old Classic. Most of the bomb guys who are into “OG” will tell you to leave your ride stock and just lower it. 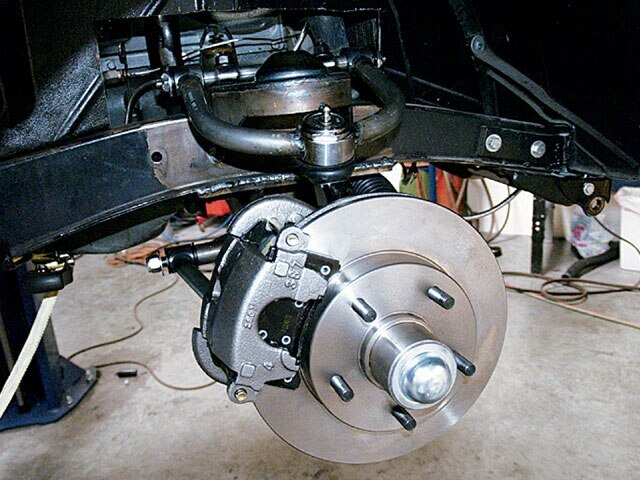 The problem with that is that the old suspensions were never designed to be lowered or to ride like newer vehicles, and the technology from 70 years ago just doesn’t compare to that of today. 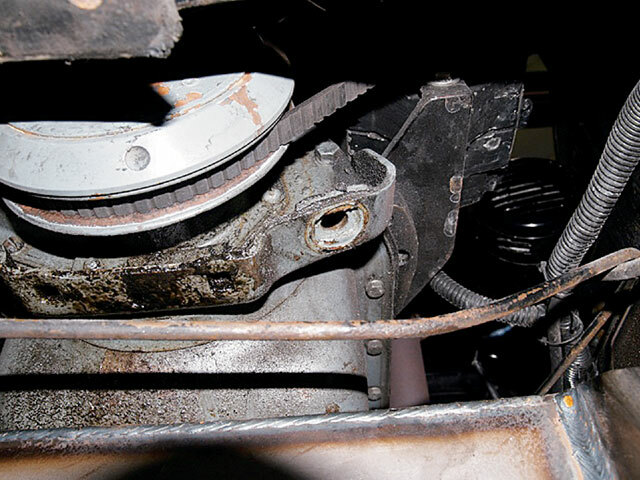 The old suspensions and roads were completely different, and car builders had no idea about adding hydraulics or, as in this case, airbags to their rides. 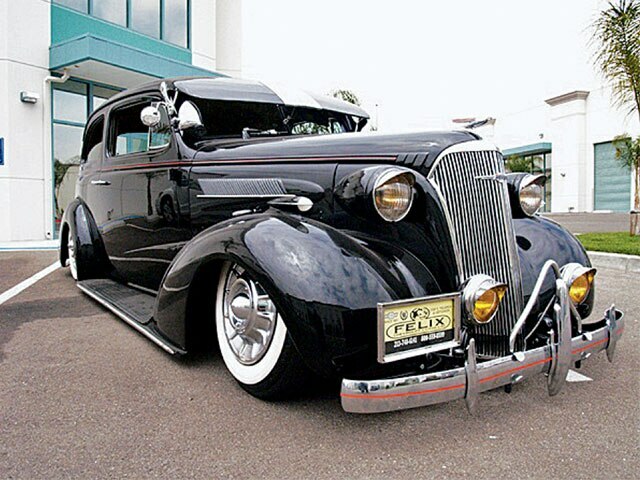 After being asked how to “bag” a ’39 Chevy, we started asking around and wound up talking to Adam over at Master Image Customs AKA MIC in Chino, California. He told us to come on down as they’re always working on these types of cars. Adam explained that the best way to lift or bag a bomb was to add a Ford Mustang 2 front end, which also makes it easy to add disc brakes. 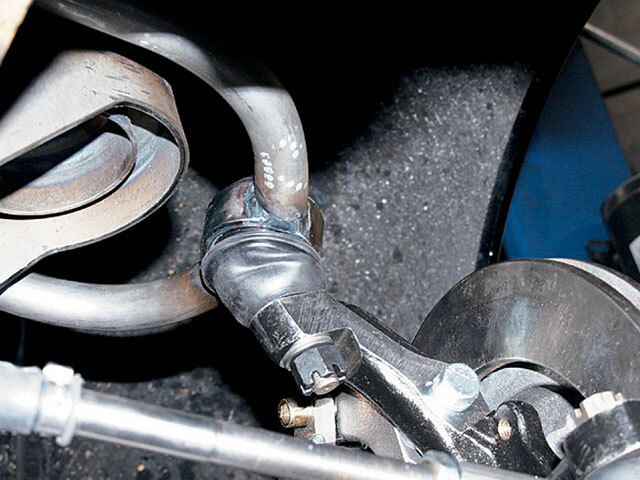 The install is something that an experienced guy can knock out himself in a day or two, depending on his suspension and welding skills. 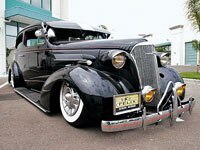 We caught up with the boys at MIC, who showed us how they modernized a ’37 Chevy Fleetline. 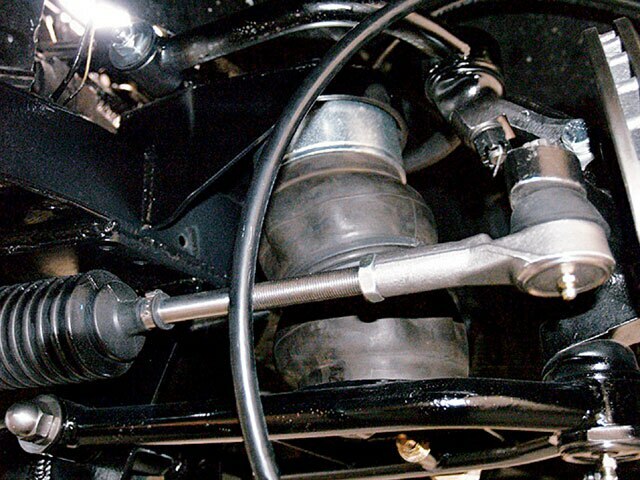 This suspension remained the same through 1939, which makes it the most common suspension on Chevy models of that vintage. 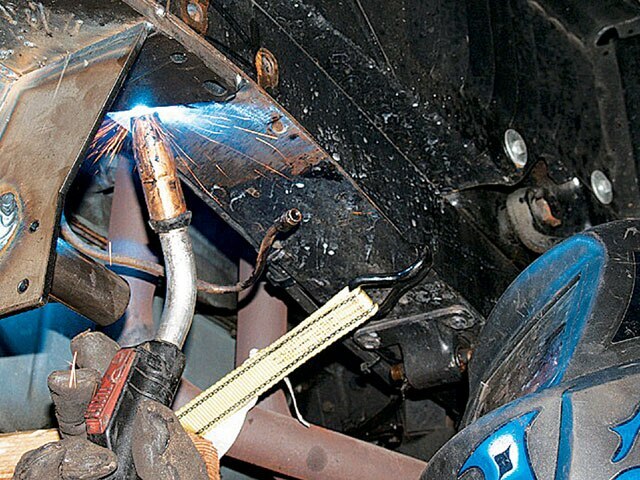 Now follow along as MIC shows us how they “masterfully” retrofit a classic using modern technology. 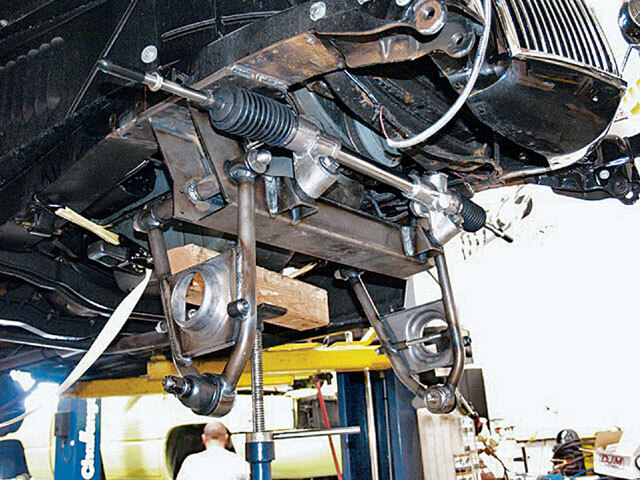 MIC first removed the complete front leaf spring suspension. 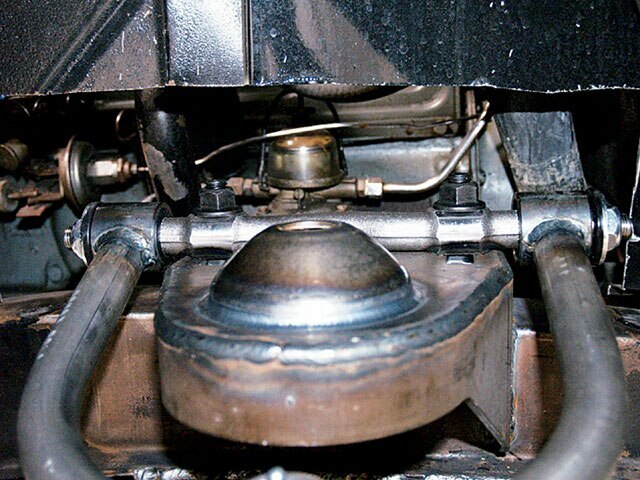 The engine crossmember is unbolted and pried off. 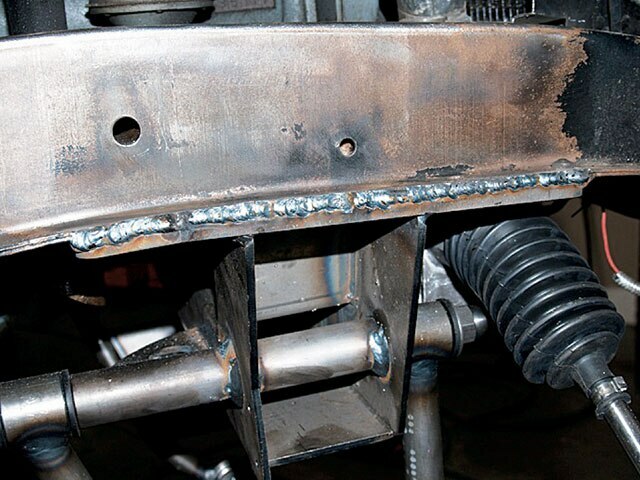 The bolts were then cut and the frame was ground smooth to allow for the new crossmember to be welded on. 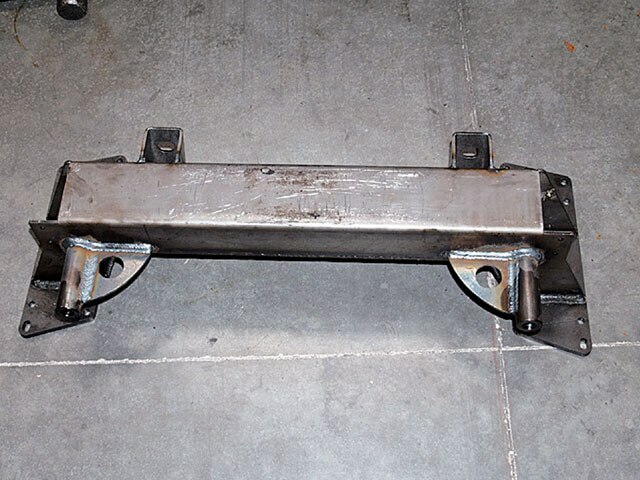 This is the crossmember that will replace the old engine crossmember, as well as support the new front suspension. The crossmember was centered following the instructions for the front clip. 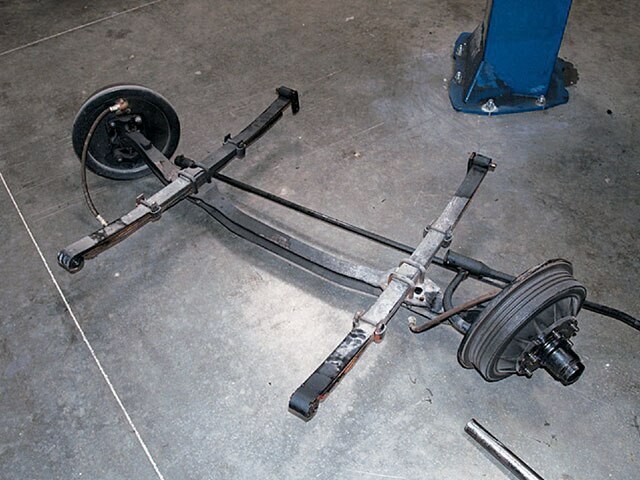 The center was then clamped to the frame on both the driver and passenger sides. 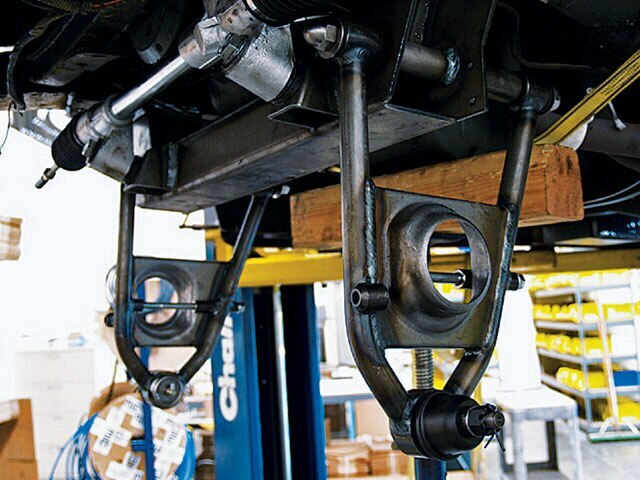 The lower control arms are bolted to the crossmember. 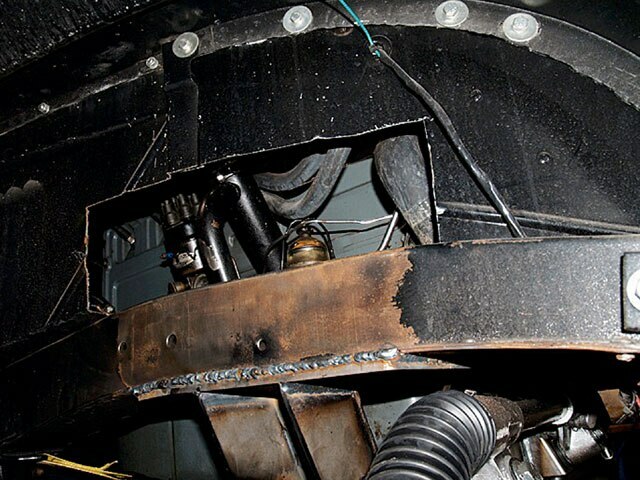 The old factory engine bushings are removed. 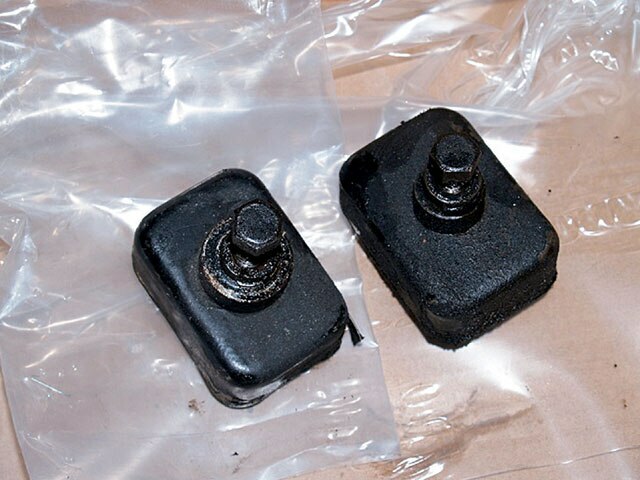 New polyurethane bushings will replace the old rubber ones. 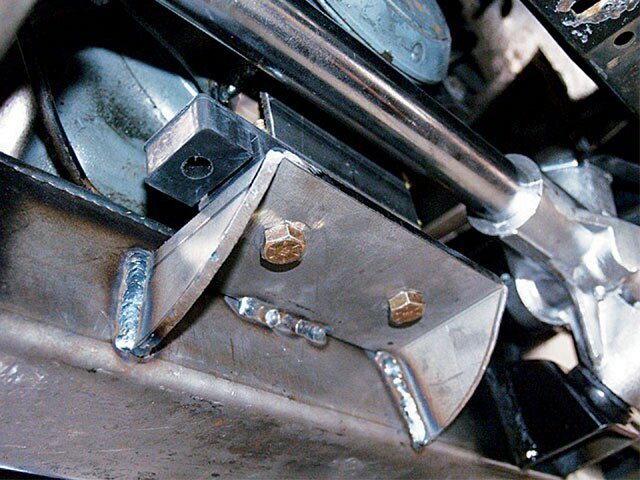 The wire wheel was used on both sides where ever the crossmember is to be welded to the frame to ensure proper contact. 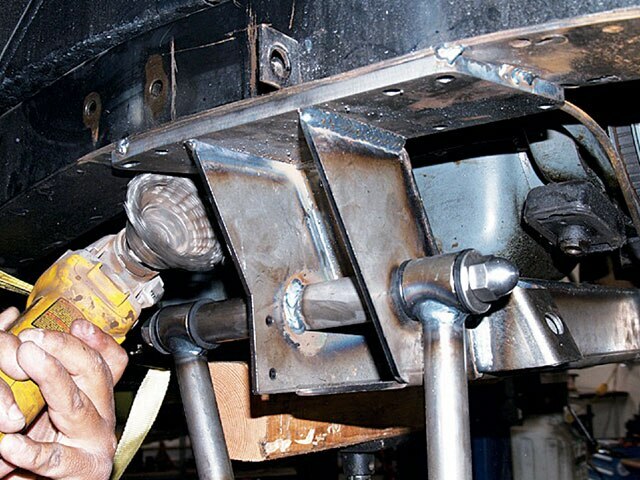 The crossmember is tack welded in from the front, rear and sides, and then the clamps are removed. 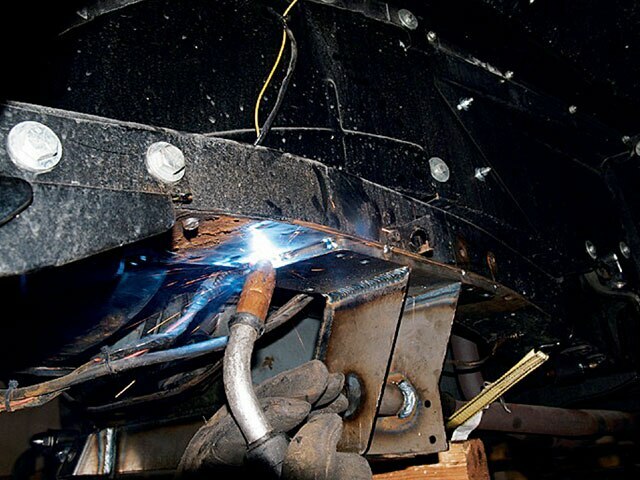 The crossmember is completely welded from the front, rear and both sides. 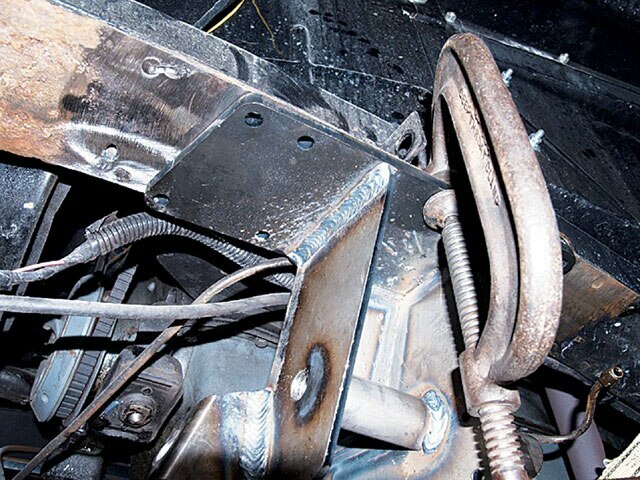 The small crossmember provided was welded on the main crossmember, in order to accomodate for the new engine mounts. 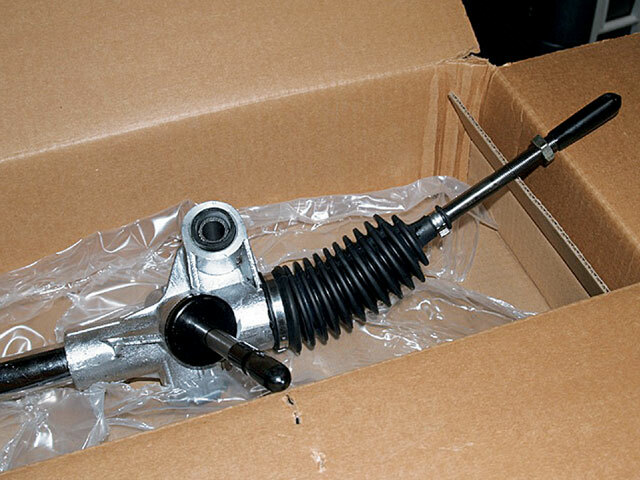 This is the new power steering which will be attached to the crossmember and new spindles. 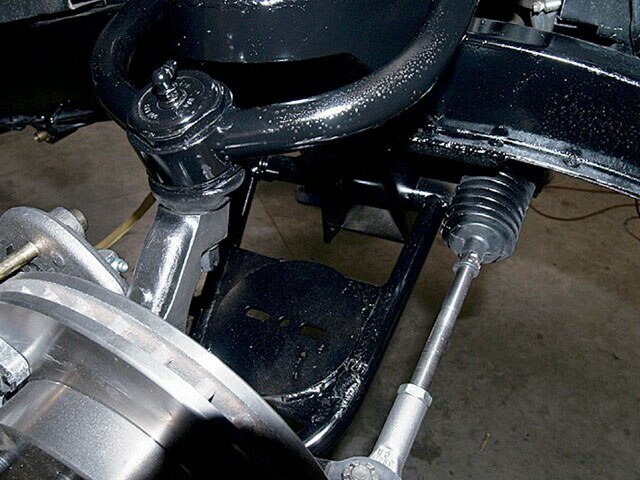 The power steering is bolted to the crossmember. 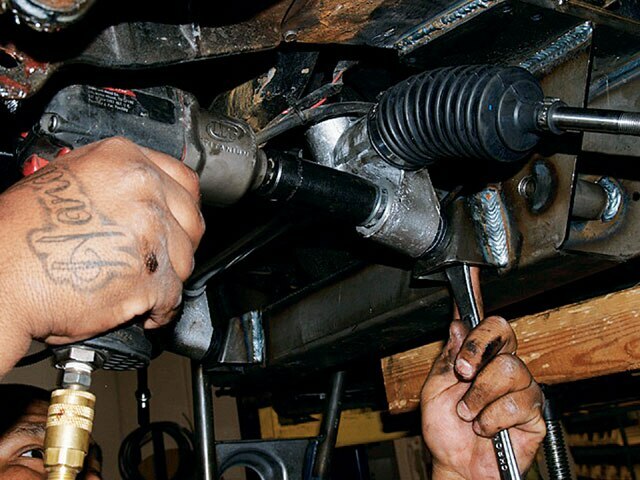 An impact gun is used to fasten the power steering to the crossmember. 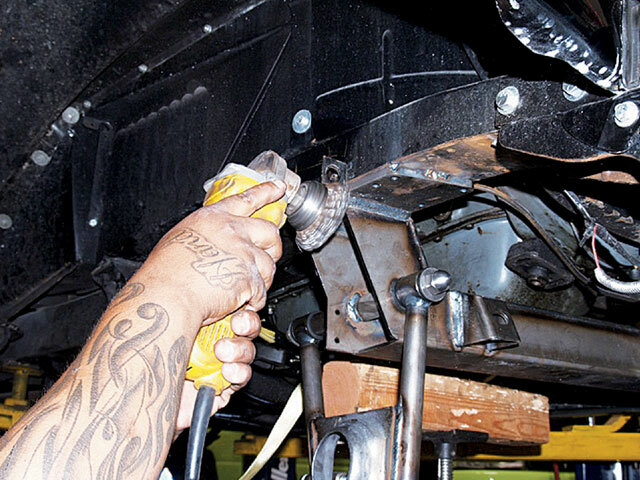 Then the power steering is secured and torqued by hand to prevent overtightening. 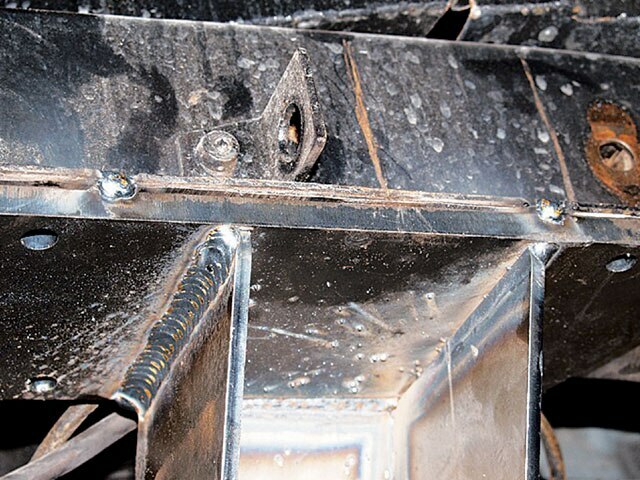 The inner fenderwells are cut out to make room for the new upper coil pocket that will be welded to the frame. 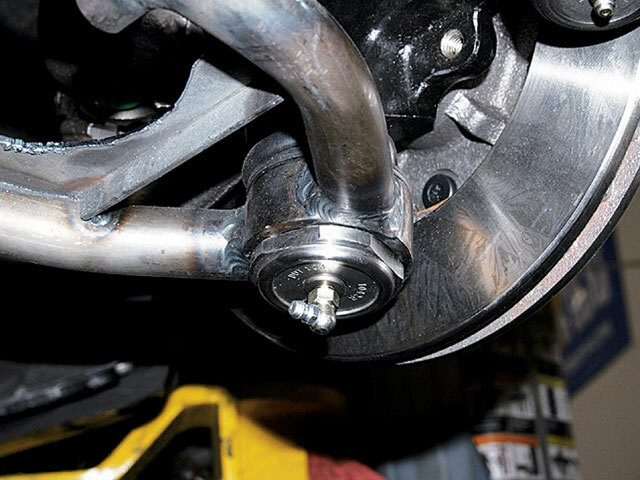 The coil pocket is also bolted to the new upper control arms. 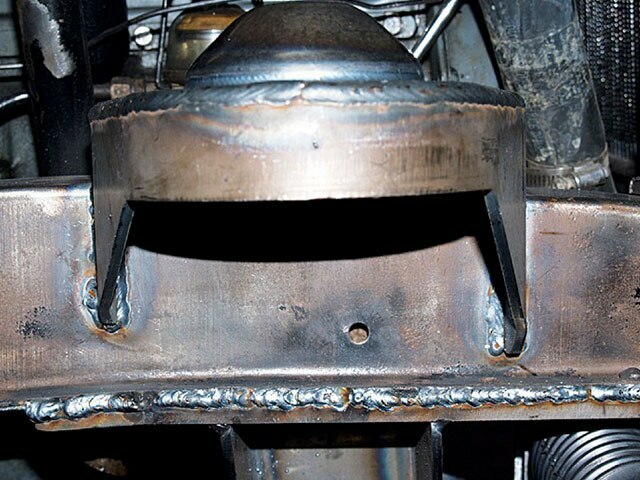 The new coil pockets are welded completely to the frame. 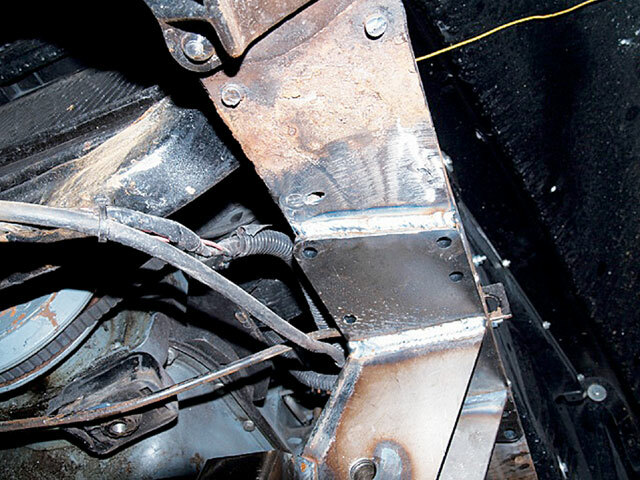 The upper control arms are bolted to the new upper coil pocket. 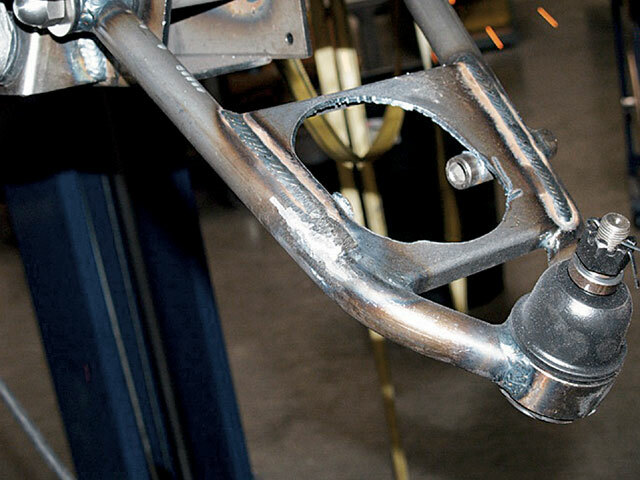 The lower control arm coil pockets are cut out and removed, and plated with a lower bag circle. 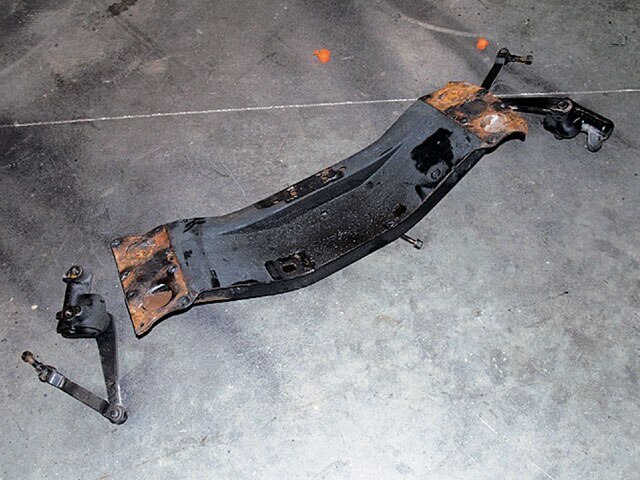 The lower control arms and frame are sprayed with rubberized undercoating. 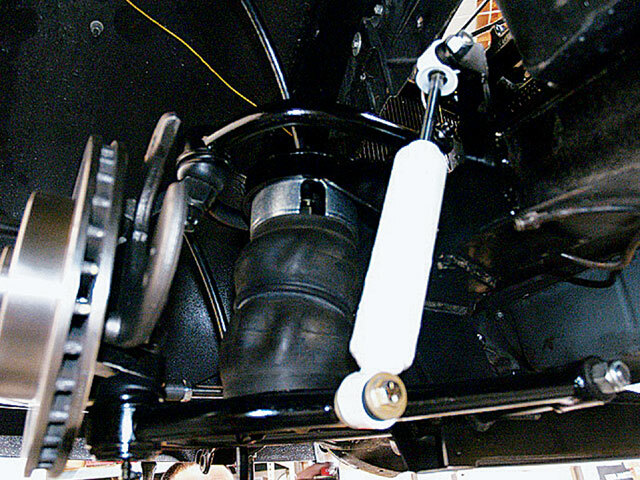 The spindles are attached to the upper and lower arms, as well as the power steering and new disc brakes. Here you can see the assembled front end components as well as the new disc brakes. 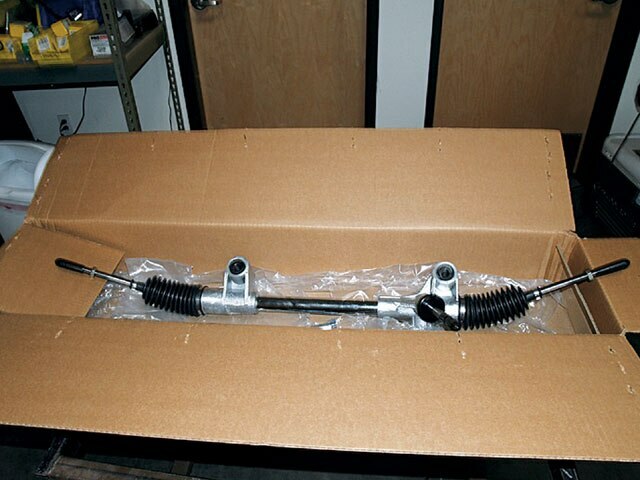 Slam Specialty RE-5 air springs, with a 4.5-inch diameter-wide upper cup and 2.25 inches tall, are used to complete the front end assembly. New Toxic shocks are attached to the arms via an MIC Relocater kit. 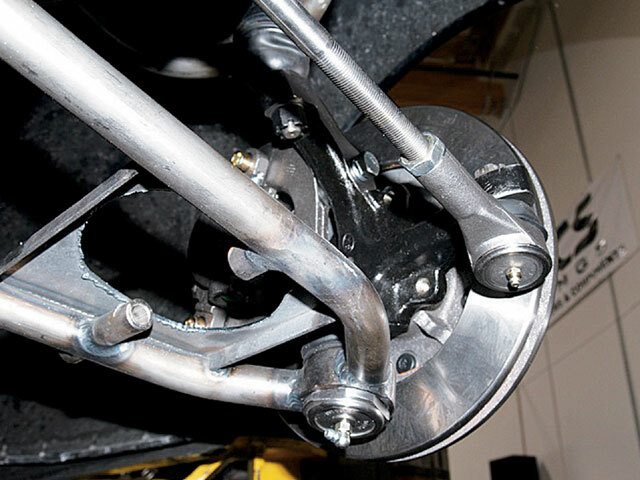 The upper and lower control arms were greased using the zerc fittings.